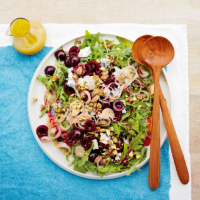 This delicious summer salad uses seasonal ingredients to make an easy starter or main course that's ready to eat in just over 20 minutes. 1. Place the shallot, orange blossom water, vinegar, mustard, olive oil and pinch of caster sugar in a bowl and mix well. Season to taste and set aside. 2. Meanwhile, place the pistachios and sugar in a small pan and warm over a low heat for 2-3 minutes, or until the sugar melts. Stir well to coat the nuts then remove from the heat and leave to cool on baking parchment. When cool, chop roughly. 3. Place the rocket onto a large platter. Halve and stone the cherries and scatter over the leaves, then crumble over the goat's cheese. Drizzle with the dressing, scatter over the pistachios and serve with crusty bread. This recipe was first published in July 2014.